I'm sure if you were to count up all the words I say on a daily basis, you would find I say "Sorry" the most. If you just look at me sideways, I will automatically think I did something wrong. And I will automatically say, "I'm sorry." I always feel like I need to apologize for who I am. And it drives me crazy — always second-guessing the things I say and do. And I bet it drives other people crazy as well. And I don't know why I do it. After researching this, I found out that I'm not alone — and experts call it the "Sorry Syndrome." Dr. Susan Gaddis of communicationsdoctor.com said, "Women say, ‘I'm sorry’ much more than men because of our nurturing nature and our desire to make everyone happy." Some of the reasons people excessively use the word "Sorry" are to settle situations, to gain acceptance, to fit in and to make those around him or her feel more comfortable, according to Suite 101. For me, saying "Sorry" was as natural to me as saying, "Hello" or "Good-bye." If I'm at the grocery store and somebody hits me, I'm the one who says, "Sorry." I think it's because I put the heavy weight on my shoulders of trying to make everyone happy. And when someone isn't happy, I accept the blame for it. When I'm hanging out with someone and I can tell he or she isn't having fun, I think that it's my fault. And you can surely predict that I will repeatedly say, "I'm sorry." I'm also scared of confrontation. I hate fights with a passion. I always feel like, if I disagree with someone, he or she will leave me. And so, before the confrontation hardly begins, I will quickly say, "I'm sorry." But I realize that this constant saying of the word makes me depressed. I like to think of myself as independent. But, by saying the word, I am placing blame on myself, and I am forfeiting my power. By saying sorry, it's synonymous to saying, "You're right. I'm wrong. It's my fault." And constantly feeling like I did something wrong and always feeling inadequate is bound to make a person depressed. On top of that, Dr. Gaddis says on Suite 101 that saying, "Sorry" too often can affect the way others treat us as well. “Saying ‘I'm sorry’ too often, especially when we know that we've done the right thing, can be dangerous. … When others see us taking a submissive role too often, they may think they can take advantage of us," she said. Notice when you're saying "Sorry." Even tally it up if you want to. Are you saying the word every other sentence? If so then, yeah, the apologizing is out of hand. And people will start to not take you seriously. Do you say sorry to preserve the peace? Do you say sorry to stay out of the way and not get notice? Are there certain people or situations that make you say sorry more than others? Is there someone who makes you feel so intimidated that the only way you feel like you can respond is by saying, "I'm sorry?" Are you so scared of conflict that you try to end it before it can start by saying sorry? And how does this need to apologize make you feel? In time this will make you feel resentment and you will begin to avoid people. Instead, face what the "Sorry syndrome" stems from head-on, which, more often than not, is a lack of self esteem. I know it's easier said than done, but learn to accept yourself and the decisions you make without apologizing for it. And learn to accept the fact that it is impossible to make others happy all the time. If you refuse a request to do something, make a conscious decision not to tack on, "I'm sorry" to the end of the sentence. If you're like me, then you're always a Yes-person, always wanting to please others. But it's not wrong to want to please yourself. And you shouldn't feel guilty for this. I wish that people could see that men also have a problem with saying sorry too much. Every website I've looked at and ever person I've asked had alwaus add sure to mention that it's the woman that apologises too much. I'm a man and every other word out of my mouth is I'm Sorry. Too true, seeing the statistics that women apologize more than men tends to invalidate the need for some men to do something more than apologize, and validates women who resist the idea of accepting fault, even when it was that woman who needs to take ownership of a mistake rather than accepting blame. My teen son is currently resisting the idea of saying 'Yes Dad' or 'yes mom' instead of constantly saying "I'm sorry" every time we try to correct a behaviour or habit ... just today he said that 'yes dad' felt like he would be lying. I am out of ideas, and for a teenage boy who says 'I'm sorry' too much, attaching stats of women saying 'sorry' more often than men is even insulting to a boy trying to develop his identity as a man. I had the exact same problem. Automatically assuming it's just women. It is too true that men have this problem too because my best friend(who is male) and I both have severe self-esteem issues. This causes us to hide behind this "Sorry Syndrome" so we don't hurt anyone. WE Both have and we are from opposite sexes. I do this all the tume to my partner but she gets angry and tells me to not say sorry, but I cant stop saying sorry otherwise it makes things worse, she doesnt understand why I say sorry a lot but I honestly dont mean to. Show her this article and try and make her understand that it's not your fault, and that you'll try to reduce it with the tips written. Male here myself, and I definetly notice myself saying sorry a lot in both real life, and even in video games with friends. It's good to know it's not just girls who have this! You're not alone! I'm in the same boat, for sure. I am a male and I apologize all the time. I have been mentally and emotionally abused a good portion of my life. When I was younger I could never do anything right and never do enough, (at least that's how everyone made me feel) even now I feel that way. (Hey another male!) I know how it feels. I always feel that I can do anything right. Or can't do enough. My friends and family makes me feel this way. Even if they do not know. I'm a woman but the same background. I was abused emotionally and I'm always saying I'm sorry. Our best personal statements has specific statements. Writing personal statements is a best thesis and writing series. Writing is important as speaking. I constantly apologize when I'm hanging out with one particular friend. I don't want to inconvenience her and I want her to be enjoying herself. Whenever I feel like I'm failing at this mission I apologize, which is every few seconds to minutes. It's a very big problem. I care more about everyone else being comfortable and happy than myself. I apologize all the time and I know its because I strive to make people happy. With ex boyfriends for example, they cheated or called me fat, and I apologized for not being good enough to keep them happy. With my fiancée now, I tend to get in his personal space when he's decompressing after work and it annoys him. He only requests an hour to himself to eat, shower, and relax for a few minutes, yet I feel like I bother him and sometimes he says I dont care or dont understand his time for his space. Its because I care that I want to be around him but yet I find myself apolgizing because I am in his space and it upsets him. I do it to my family, apologizing for not being good enough. And what's worse is I have Asperger's Syndrome and it makes it even harder with my anxiety, worry, nerves, depression, critical nature over myself- on top of the fact I was made fun of, walked all over, taken advantage of and always put down. My fiancée feels overwhelmed at times because of how its become habitual and cant help but apologize for not being good enough or not keeping him happy. It annoys him futher when I ask constantly if he's happy and feels loved because of being an aspie. I'm not always sure of how someone feels about me or what I'm doing so asking if he loves me and feels loved, well, they go hand in hand with my Sorry Syndrome. I apolgize for needing to hear how he feels since I cant tell as an aspie and them apologize for not knowing what his answer was before I asked. He then thinks I'm questioning him which I apologize for and eventually, I find myself apologizing for talking so much only to apologize again for apologizing so much. He even said to me just now "you've apologized too much. Just know I love you". I'm always saying I'm sorry... I know I carried that habit from my childhood. I was a single child living in a very abusive controlling dysfunctional household. How do I break the habit? I have this sorry syndrome. Everyone yells at me for it which makes me apologize more. Sometimes I wonder if us who say sorry too often is a result of mental-abuse. Would I say that I was mentally abused? Probably not. But there have always been extremely explosive and hateful/angry people in my family. As an adult, I am such a wuss and I am always backing down from arguments and not being my real self. I feel like I'm invading the city's privacy if I go to a Target store. It's terrible. I realized this comment is just me venting. But let me say this--it's not just women. It's men too. I feel guilty for men because men are always being put down no matter where you look. This article didn't particularly put men down or anything, but I just wish more people acknowledged male problems. Excessively saying "Sorry" is learnt behaviour brought on by you adapting to your environment. It is a shame that others criticize you for saying sorry repeatedly. Judging you for saying the word "Sorry", or for anything else, is likely part of why you have learned to say it so often. Trust me when I say it's not you, it's them. I say sorry very often, I use it to diffuse any situation. Sorry doesn't always mean I'm apologizing for my actions. It can mean that I'm sorry about the situation which has transpired, even if they are in the wrong. I can be sorry that they feel a certain way or have a certain opinion. You can be sorry that someone got hurt. You can be sorry that someone is sick. Start looking at it from a less victimized angle. Using "Sorry" can be an empowering tool to improve your soft skills. Next time someone tells you differently, let them know you disagree and embrace the things that you say. They may be likely to reflect on their original view. Saying sorry doesn't make you passive, it states that you are "Open to discussion and are not trying to be closed-minded". I've had many discussions that have nevertheless deteriorated, and I'm sure you have experienced the same. Stay true to yourself and be proud of your kind nature. Don't label yourself with something negative like "Sorry syndrome". We are all byproducts of our environment and, unless you are hurting someone through your actions, you should never be ashamed of being yourself. This is me. 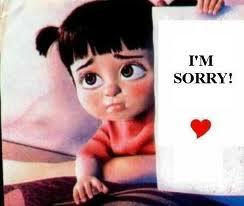 I say I am sorry about EVERYTHING... and even if someone tells me that its ok... I'll persist. I try try try to stop it but I ALWAYS feel like I am at fault for everyones unhappiness. Especially my daughter and husband. Maybe it has something to do with self confidence or self esteem? um. well, it's not really your job to make everybody happy... I mean, you should try, yes, but you can't please everyone. try to be confident in what you do and say. Im not sure why i find myself always saying "im sorry" to my girlfriend it just seems like i cant do anythibg right. I dont want her to hurt or anything negative. Im not sure why but she gets so mad and now its to the point where she is talking about leaving me after three yrs. Im not sure if im suffering from some kind of disorder but i do aim to please. I do nit like confrontational situations. When things get bad my heart race my palms get wet my insides feel like a pin ball machine. Not sure what to do anymore can anyone help me bc its becoming unbearable.